Almost in every corner of Russia there are varied natural beauty. It’s endless if we discuss the beauty of Russia. Various landscapes are there and have received recognition from the world. Starting from the unique cliffs of Lena Pillars, the second longest Spit in the world is the Curonian Spit, Putorana Plateau, and many more. You must feel the beauty of natural Russia as long as you live. In addition, Russia also has a very unique ice cave, namely Kungur Ice Cave in Perm Krai, Russia. Kungur Ice Cave is a karst cave located in Urals, Kungur City in Perm Krai, Russia on the right bank of the Sylva River. This cave is a pearl of Ural, one of the most famous places in the region. 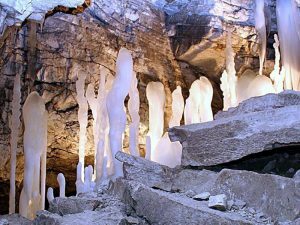 This cave is famous for its amazing ice formations and is a truly popular tourist landmark. This cave is often referred to as the kingdom of stalactites and stalagmites, or even more romantic designations “frozen ice and rock music, grandeur and silence of space”. For those of you who are interested in visiting this phenomenal cave, we have provided 10 Facts You Need To Know Before Going To Kungur Ice Cave in Perm Krai, Russia. These facts will surely encourage you to immediately take a vacation and enjoy the grandeur sensation of Kungur Ice Cave. The kingdom of slactite and stalagmite reaches 5700 meters in length. However, not all regions of the cave can be explored by tourists. Only 1500 meters can be explored by tourists, equipped with special facilities such as special lighting and always cleaned. First you have to pass a 40-meter tunnel to see the eternal ice kingdom. Lighting in this cave is what adds to the beauty of this place. The temperature in most of the caves is close to zero. The minimum temperature in the cave is at the entrance of the cave. That is around -2 to -3 degrees, and during winter it can reach -20 degrees. So, for those of you who are interested in visiting this place, you have to prepare a thick wool jacket to prevent it from getting cold. The best time to visit Kungur Ice Cave is in late winter or early spring (February to April), when ice formations reach the most spectacular shapes and sizes. At this time, there are 48 caves found in Kungur Ice Cave. And the biggest cave in Kungur Ice Cave is the cave of Geographers. The size is 50,000 cubic meters. This cave is considered to be the most beautiful cave. Especially during the winter, this cave has very beautiful stalactites and stalagmites. Not only the cave, around Kungur Ice Cave there are also charming lakes. The clear waters of the lake are connected to the river Sylva, and when the water inside rises, the lake will overflow. The largest lake is The Large Underground Lake, and has a volume of 1300 cubic meters of water. The depth is 3 meters. These lakes have very clear water, so you can clearly see water crayfish and small frogs in the lake. Scientists say that the age of Kungur Ice Cave is 10-12 thousand years old. And this cave is still growing and growing today. The study of this cave only began in 1703. The first commercial visit to these caves began in the mid-nineteenth century. Kungur Ice Cave has been known since 1703 when Peter the Great issued a decree that sent a famous geographer SU Remezov from Tobolsk. He drew up a plan and made the first sketch of the cave. Kungur Ice Cave is the oldest underground tour in Russia. The first route, the classic route with a distance of 1.5 km and takes about 1 hour 20 minutes. One hundred thousand people come every year and more than five million people have come to this place since it opened. In the eastern part of Kungur Ice Cave there are two ancient settlement sites from the 7th-9th century related to the Lomovatov Culture. The ancient Yermakov burial site has been known since the 19th century. In the Kungur Ice Cave, there is a set of narrow stone stairs called “women’s tears”. The name comes from the fact that a foreign princess had stumbled and fell on the stairs. After he returned home, he married. So that people believe that if there are women who fall or stumble on these stairs, they will get married soon. This myth depends on you, believe it or not. During the summer, stalactites and stalagmites in Kungur Ice Cave will remain frozen. Eternal winter is in this place. And during the summer this place does not diminish the slightest beauty. Underground tours with a very diverse kingdom of stalactites and stalagmites must be very difficult to find. And maybe you can only find it in Kungur Ice Cave. If you come to this place, this will definitely be a tourist experience that you have never felt and you will never forget. And for those of you who are interested in visiting this place, that’s 10 facts you need to know before going to Kungur Ice Cave in Perm Krai, Russia that we have presented. Remember! You must provide a thick jacket to keep it warm. Because this is an eternal ice kingdom. We hope that our article can help you find your holiday ideas.